Shall I make you a Martini? Gin or vodka? Bitters? Lots of vermouth? No vermouth? Olive or twist? Up or rocks? Such a simple drink, so many options. And opinions. “Dirty,” of course, refers to the addition of olive brine to the otherwise pristine Martini. President Franklin Roosevelt is credited with popularizing the style in the 1930s, and even introduced Joseph Stalin to them at the 1943 Tehran Conference. Stalin didn’t like them. So how “dirty” is a Dirty Martini? You won’t get many agreements on this issue, since the answer is, “As dirty as you want it to be.” Roosevelt, by all accounts, was quite careless with his mixing, preferring to regale his guests with stories rather than focus on the mixing task at hand. I’m guessing this resulted in some pretty dodgy cocktails—and Dirty Martinis that were all over the map. Consistency didn’t seem to be an issue at cocktail time. Stir (apparently FDR shook) all ingredients with ice, and strain into chilled cocktail stems. Rub the rim of the glass with lemon peel (discard the lemon); garnish the drink with one olive. That lemon peel rim is a little unusual, and a nice touch. As mentioned above, the guideline for the amount of olive brine is guided by your taste. Olive brine is unpredictable, and dependent on the source. I suspect that most home bartenders get their olives the same way I do: in the skinny round jars from the grocery. Some are very salty, some very acidic. Your proportions will be tuned to the juice of your preferred brand, so the “one teaspoon” guideline is just that—a guideline, and a minimalistic one at that. If you are really in the mood for olives, you may want to add considerably more brine. The problem with too much is that you will lose the character of the vermouth and gin. Vermouth helps the olive brine blend with the gin, so it’s the nature of this cocktail to be very “old style,” heavy on vermouth. A “dry” Dirty Martini just doesn’t seem to blend properly. The Dirty Martini is definitely a “love it or hate it” cocktail. If you’re an olive lover, it will be a welcome addition to the repertoire. 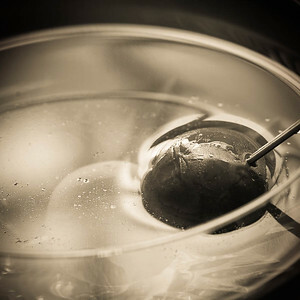 “The Dirty Martini” at cold-glass.com : All text and photos © 2012 Douglas M. Ford. All rights reserved. I will eat Manzanilla olives straight from the jar (or any olives, really) but the dirty martini just doesn’t jive for me. I think I’m not a fan of olive flavor combined with the other two. Speaking of martini garnishes, what’s up with the cocktail onions? I’ve been dubious of that particular style for eons. Possibly because I don’t like raw onions, but whatever. I’ve always had trouble with the little onions, too. Never liked the flavor straight, and gin doesn’t seem to rescue them. So I’m guessing that I won’t be writing up the Gibson anytime soon. Guess FDR and I would get along okay. I think it’s a good combination. However, I agree with you and Jackie about the funny little onions. How remarkable that would be, to be able to drink a Dirty Martini with Roosevelt, and listen to his cocktail-hour tales. He was, by all accounts, quite a raconteur. I know it’s frowned upon by purists but I can see the point. I never go really dirty, but to those purists, even an olive (rather than just lemon) is too dirty. So though I often want the pristine gin with twist, sometimes I also liek an olive, even a dripping one (that’s dirty enough). Sometimes you feel like a Martini, but you’re not in the mood for that super-crisp pure concoction. The brine (or just the olive) can add a little something that tones it down a bit, if you need it. Slightly off-topic, but I’ve been on the hunt for new martini-appropriate glassware; what is the glass used in the main photo? Complete guess: vintage champagne coupe? That glass is Vera Wang Wedgwood. I don’t recall the name of the specific style. I just googled it—unsuccessfully, alas! Though it’s modern, it may be out of production right now. Your local china shops may have knowledgable people who can help hunt it down, though. Thanks, Doug. I dug around a bit and wasn’t able to come up with anything either. I like the idea of a coupe here for both it’s form (any other drink served up would work equally well) and it’s function (v-shaped martini glasses are more prone to spillage… especially as the night marches on). But, it may also be that the martini glasses I’ve encountered in the past have had overly shallow walls. Would you have any recommendations for modern glassware in either style? If not, I suppose I’ll have to start checking out the vintage/antique stores. Coupes don’t seem to be very popular among glass-makers right now. I’ve had the best luck trolling antique and collectibles stores, and that’s where I’ve found much of the glassware I use in the photos here. But here’s one modern thing to check on: I like Schott’s Tritan series; the styling is between a coupe and a V-stem. They are commonly available in kitchen stores (here in Minneapolis,) affordable, and made with break-resistant, dishwasher-safe glass. (I’ve only tested the dishwasher part.) There are two styles: shorter and taller. It would be very nice to see more coupes on the market, but it just doesn’t seem to be happening right now. I was excited to see this drink come up in a post. It’s a favorite among my friends, and I consider it my signature cocktail. We’ve found a local bartender who knocks them out of the park. They’re so easy to mess up, I’m sure that’s the problem much of the time. (For those not adverse to olives.) A poorly made dirty martini is a sad, sad thing. Not sure I could handle FDR’s proportions. I go more the 1/2 to 3/4 oz brine, 1/2 oz vermouth route. “…easy to mess up…”, oh yeah. I’m delighted that this is a favorite for you and your friends—and that you actually have a bartender who can put up great ones. Stick with that bartender! Dirty martinis are my favorite – especially with an appetizer – that would be 3 olives! 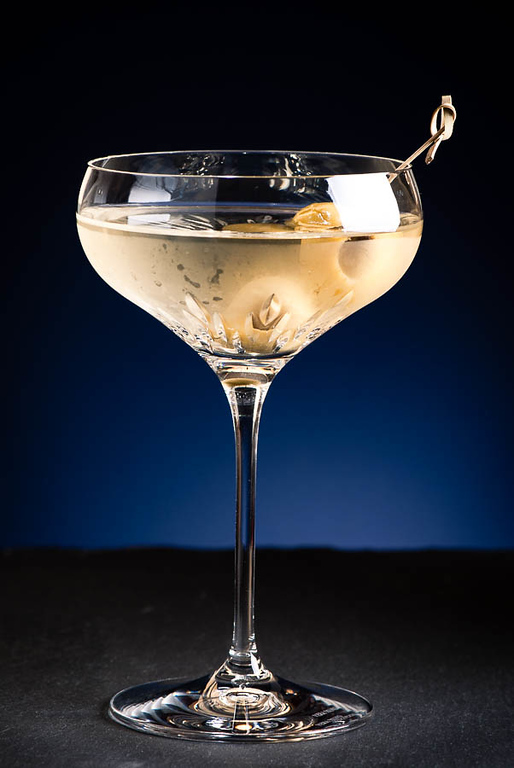 Enjoy – so glad to have found Cold Glass – a new source for my husband’s cocktail concoctions! I’m delighted to be a source, thanks! I prefer my martinis on the dirty side. I’m glad to have found your blog as a source for new recipes for my husband to master and serve me! Excellent! I’m glad you found us, too.